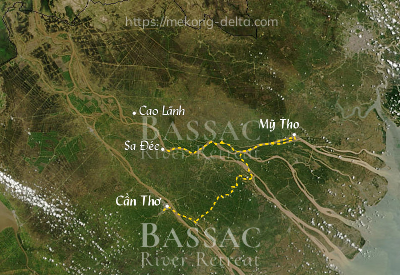 Enquire or book a trip along Cần Thơ - Mỹ Tho - Sa Đéc - Cao Lãnh. Boarding back, complimentary drink as a welcome back on board. Open bar and rest on the deck enjoying the sunset. The crew will serve dinner while the Bassac is cruising through Co Chiên then Cho Lach towards her anchorage point for the night. If you are staying near Cần Thơ, you may make the best of your time and take a cycling tour, or a cruise to a Khmer sanctuary or try yourself at rowing Mekong delta style. offer a wealth of activities and day tours, and also initiations to arts and crafts: Mekong delta cuisine and fruit carving. You will find with the same attention to detail and caring service as with us. You may also spend a night or more in the Nam Bộ Boutique Hotel, a charming hotel right on the Ninh Kiều pier, at a stone's throw of the Bassac's mooring point. 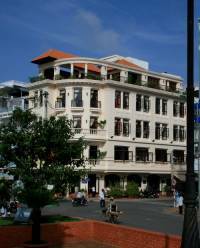 The Nam Bộ has 7 suites only, welcomes families and offers breakfast on a comfortable terrace with a view, at l'Escale. Before boarding, you may take your breakfast in one of the good places near the river in Cần Thơ. Try the Nam Bộ restaurant, 1 Ngô Quyền, facing the boat bus pier, near the statue of Uncle Ho, or the Sao Hôm, in the old market hall, right in front of the Bassac's mooring point. Or if you prefer to be away from the crowds, you may like to try breakfast at l'Escale, on the top floor of the Nam Bộ, a beautiful breakfast in front of the river. You may also take your breakfast right at the floating market on board a Mystic sampan before boarding: a beautiful breakfast, maybe complemented with fruit bought directly on the floating market, on board sampans built in the same spirit as the Bassac. We also offer a beautiful cruise to a Khmer sanctuary, which takes you back to shore on time to pack and board a Bassac. You may also fly directly from Đà Nẵng if you are coming from Central Vietnam, that will save you hours on the road from Saigon. There are daily direct flights between Đà Nẵng and Cần Thơ. Vietnam Airlines flies in the evening, and you can spend the night in Cần Thơ, then enjoy activities in the morning before boarding.